"...each a reminder of vanishing British Empire"
"Flying over places with names fast becoming known over the world - Dalat, Nha Trang and Qui Nhon on the coast - the scars of battle are plain to see. There is no holding back on the airstrikes here... flaming napalm bombs scorching the undergrowth. Whatever may be the rights and wrongs of this conflict, low profile it certainly isn't. I think of our SAS and Gurkhas in the jungles of Borneo: silent, restrained - and effective." 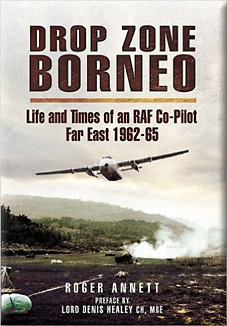 "There were no air-strikes in Borneo... but the battle was always for hearts and minds. By not strafing the villages of Kalimantan we lost no friends and made no new enemies. Now, Malaysia is one of the 'Tiger Economies' of Asia." What makes this book so approachable is the way that you see the Far East through the eyes of a young, carefree, RAF bachelor. You see how his eyes light up with the excitement of Singapore, how he longs, forlornly, for an overnight stay in Thailand, you accompany him on some very wild mess parties and leaving-dos (including his own towards the end of the book). He is definitely a hot-blooded male who enjoys the company of women and we accompany him on tours of Malaysia in his ever sportier cars. It is the life of a man in his 20s who has a dangerous job by day but is determined to enjoy himself when he returns to the relative safety of base or the luxury of leave. His one experience of spending time in the jungle comes across as something of a comedy of errors as he undertook a jungle survival course. The difficulties and issues of living in a hostile jungle without the extra burden of Indonesian soldiers out looking for him, allowed him to gain a new found respect for the soldiers he was dropping supplies to below from his Argosy. The other joy of reading a book like this is for the fascinating asides that you might miss in a regular history book. For example, he gives an account of his flight to Jakarta to evacuate the British there as Indonesian rhetoric spilled over into open hostility and violence. You learn about some of the strange objects that were dropped into the jungle as supplies: including corrugated iron, goats (for Gurkhas to sacrifice) and most bizarrely of all - cats! (you have to read the book to find out why). There was an interesting second hand account from a pilot escorting the Queen of Tonga on her last flight from Tonga to New Zealand which he believed showed the "Spirit of Commonwealth" that also accounted for the Australian and New Zealand commitment to victory in Borneo. You also get an insight into the developing political realities of South East Asia including, for instance, the surprise and practicalities of Singapore leaving the Malaysian Federation so suddenly and the impact (or lack of) that this had on the war with Indonesia. Mainly though, you gain a little understanding and appreciation for what it was like for a 20something serviceman to find himself in an exotic part of the world fighting a war which few people had heard of in an increasingly complex and complicated world. The book is only 150 pages in length and the author has an easy to read and engaging style. Do not be put off that this is a book with limited appeal to aviation enthusiasts. The book actually casts an eye on an unusual part of the world during a fascinating period of time. It is truly a book explaining some of the practicalities of Britain managing her exit from Empire.